I came cross the word diplomacy when I was very young and since then, I took the opportunity to understand it from all possible angles. To my understanding I believe diplomacy is a ' code of conduct' that governs people’s behavior, image, language and actions in the presence of members of the international community. And with the above in mind, I believe most individuals, groups or countries have forgotten the importance of diplomacy and this can be displayed in the unfolding events from all corners of the world. Furthermore, if am not I believe diplomacy in all aspects is a protocol that any individual or country observes, but with recent events from Ukraine and South Africa leaves less to desire about diplomacy and protocol in general. Indeed it is a known fact that Ukraine is a land known for its famous distinguished boxers Vitali Klitschko and Wladimir Klitschko also known as the 'Klitschko brothers', but little is known about the box sessions that take place in the parliament or Verkhovna Rada whenever an agreement is not reached among politicians. As an illustration of the already portrayed mentality of boxing above, a no-mercy show-down boxing was done within the Verkhovna Rada premise were lawmakers Vadim Ivchenko and Yegor Sobolev battled themselves tirelessly until separated by sergeant of arms. Anti-corruption between Yegor Sobolev and Vadim Ivchenko was a highly heated and resulted into bleeding nose and mouth on 12 February, 2015. Legislative battlefield: In July 2014 when President Petro Poroshenko proposed army mobilization bill that did not impress most MPs hence the Rada was turned into a battlefield. Knockdown for opponent: Tempers and punches rose due to failure to come to agreement over the crisis in eastern Ukraine with MP Aleksandr Shevchenko setting punches on Oleg Lyashko in August 2014. Gender equality: A video leak in April 2014 showed two female MPs in Rada having a heated verbal political dispute. Eggs and smoke grenades as arguments: One of the most picturesque fights to take place in the Rada was in 2010, when MPs were setting off smoke grenades and throwing eggs over the ratifying of extending of the naval base in Sevastopol that saw the speaker shield himself with an umbrella to keep the session going. Although, the boxing events in Ukraine are not the only that break protocol and diplomacy, South Africa and Julius Malema's madness made headlines international. And the exchange of abusive words not forgetting punches and kicks in the presence of diplomats was unfortunate and paints a bad image of South Africa locally and internationally. With Julius Malema being the master minder of all chaos in the South African parliament, I believe President Jacob Zuma's ghost of kicking out his former youth league president is haunting him down day and night. As a matter of fact, President Jacob Zuma must find himself heavy security when he is to address the state of addresses in parliament because Malema and his Economic Freedom Fighters are not fans of his excellence for Malema and co. make serious business and its high time President Zuma begun to take Malema seriously. Though, the relationship between President Zuma and 'juju' has turned sour many might ask what really happened to the inseparable friends that once endorsed each other as highlighted in the below graph. At one point President Zuma described 'juju' as the 'new ANC' and a 'future leader', but I believe President's state will haunt him down in his second term for it seems 'juju' believes the future is now and cannot wait any long, watch out your excellence via 'Juju' is seen as a potential replacement for you. On 17 June 2008, 'Juju' in his capacity as then ANC Youth League vowed and I court, 'we are prepared to take up arms and kill for Zuma. On 16 June 2014, 'Juju' in his capacity stated that Zuma must suffer and I court 'they killed our people and never responsibility for that'. On 12 February 2015, 'Juju' yet again interrupted President Zuma's State of the Nation address by loudly demanding the president ‘pay back the money'. From the above time chart, I believe readers can make analysis and conclusion on the love turned hated affair of President Zuma and 'juju' even though I know more is yet to unfold. At this point all I can say to the readers is to be expectant of more action from the South African political scene for 'Juju' seem ready to knockout his former boss. Honestly, I am tired of calling President Mugabe 'President' for he has outstayed his time and not forgetting his new acquired title of chairmanship of the African Union (AU),therefore in this paragraph I will refer to him as 'uncle Bob'. And for those of us that do not know Uncle Bob then I will explain who he is. Uncle Bob is the anointed leader of Zimbabwe who celebrates his birthday by spending close to a million dollar of tax payers' money in a country that is undergoing economic recessions and sanctions. Controversial as it may seem, Uncle Bob is indeed one true African hero who has always impressed and lost us in speechless and tears due to his appetite for words, but yet again he has impressed us at 91 years with a sensational 'Mugabeing' pre-birthday dance. 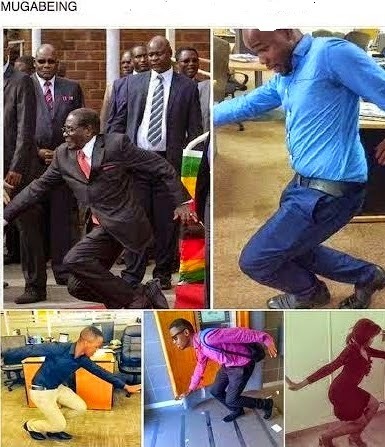 The 'Mugabeing' pre birthday dance is not really a dance but the most Uncle Bob fall down due to undisclosed reasons leading to the suspending of his seventeen security entourage. Correspondingly, after uncle Bob's fall went viral on social media with twitter coming up with a hash-tag of 'Mugabeing'. Generally speaking, I think the world loves uncle Bob looking at all sorts of hilarious memes that was attribute to his legendary fall and as for 'Juju' and President Zuma I think 2015 is indeed a great year, for we watch at a distance as you battle it out while improving people's standard of living.